Let me tell you a little story. This past weekend I was in Texas. I love Texas. 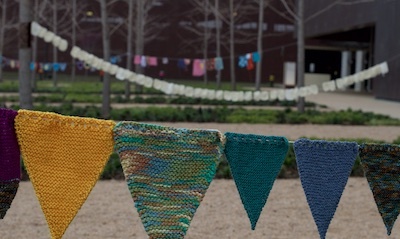 I’ve never had a bad time there, in any city, and I admit a particular fondness for the DFW Knitters Guild, and the annual Fiber Fest they put on. Even though they’re all volunteers, they conduct themselves like the best sort of professionals, and they’re sweeter than pie to boot. The thing is organized up one side and down the other, and everything was perfect. (The talk went off pretty well too, I think.) I hope they have me back forever. All of that said, what I want to tell you about is what happened on Saturday morning. The marketplace at the DFW Fiber Fest is awesome. I don’t know how else to describe it. It’s a carefully curated collection of mostly Texas stuff, and there were so many fabulous vendors that I was at serious risk of an episode of some type or another. Mostly, I was saved by the fact that I was teaching. The Marketplace opened at 9:00, but classes started at 9:30 – so I was largely safe on that end – and I’m not even sure I made it out of my classroom every day at lunch, visiting with students, answering questions and switching over from one class to another. Classes ended at 5 – but after hanging with students, cleaning up, and organizing myself to go back to the hotel, I wasn’t finishing before 5:30 or 5:45, and the Market closed at 6. This was all, I thought, very lucky. Exposure is risk, and I was fine with that risk being minimized. Eventually though, the Guild executive (being thoughtful, amazing and thinking of all possible problems) realized that the teachers didn’t really have time to shop, and arranged for the market to open early for us one day – just so we would have time. I know. Their hearts are in the right places. So the night before, I made a plan. Instead of just going in there and experimenting with my historically poor impulse control around that sort of thing, I looked over the list, mapped my route, decided what I would buy, asked a few vendors to set a few things aside. I got ready, and on Saturday morning I blew into the Marketplace, and executed the mission in a way that would make Navy Seals look lazy and disorganized. On the sixth transaction, my credit card was declined. I asked them to run it again, because there’s no reason for that (they know I travel – being in Texas alone shouldn’t be enough to trigger a problem) it failed again, I whipped out another card, used that, and cancelled the rest of the expedition. I knew what I had to say then, and I did. Thank you for the lovely post. I think I read it first, so had to reply right away. Now I want to see what you bought , since I’m going to the first Stitches in Texas in September ! There is a KEY difference between DFW Fiber Fest and Stitches! You’ll REALLY want to come to DFW Fiber Fest next year. At Stitches, the vendors are largely “professional vendors” and they come from all over — stores like Webs. 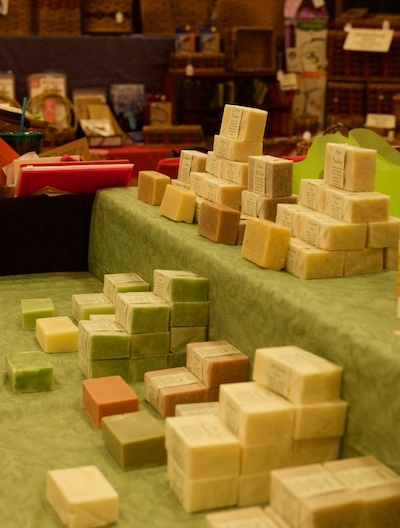 At DFWFF, the vendors are largely LOCAL and extended local (Texas, Arkansas, Louisiana). Some of us (like me) don’t travel to other shows. I have a brick and mortar store north of Dallas, so I can’t go to many shows anymore AND it would not make sense for me to fork over an entire month’s rent to have a booth at Stitches. So if you want to get the REAL flavor of the south and our Very Talented Artisans, you need to come to DFWFF. PS So sorry about your phone. On the one hand, you have to admire the credit card company for safeguarding your money. On the other, you want to wring their necks for making life so difficult. I hope you got all your yarn AND that it all comes home to you. “I’m not insane. I’m just very efficient,” is going to be my new motto. I’m with Sans. That is TOTALLY my new yarn buying motto. This happens every time I go to Stitches. The first night of the Market. I wait on hold for 30 minutes to get through, and then say, and this is going to continue all weekend, so deal with it! Thanks for the LOL moment! Hope everything catches up to you soon and sorry about both the phone and the travel glitches. I love being a silent small fly on your shoulder during your expeditions. AND, no charges to my credit card, just longings for wool and accouterments. Can’t they, like, put a note in your file? “Anything relating to “fibre”, “wool”, “knit”, or “spin” in the shop name gets an automatic pass. That’s what I was thinking — shouldn’t this be a familiar “card use” pattern to them by now? Dangit, where’s the like button? Always tell the cc companies where you’re going before you go. But I’ve even had that happen when I was twenty miles from home–booth to booth just doesn’t compute in Mastercard’s mind. Hope you got lots of great stuff and glad you had a good time! They don’t even officially care any more necessarily–when you try to call some companies you get funneled into an auto-system to ‘report upcoming travel’ and end up talking to a machine if they feel like humouring you…sigh, just when you’re trying to be forward-thinking and all adult-like!! I am cracking up- this could be me. I am SO glad I bank at a local credit union where I am on first name terms. I just warn them ahead of time. It only took one time being locked out for me to figure out that I also needed to let them know what I would be doing (the one that did it was buying two fleeces on a small island 3000 miles from home). Love it! Some states *are* really big. I travel within California all the time. They really need a better/smarter automated system. And I hope all your ‘wool stuff’ makes it safely home–eventually! Sounds like a great time, with minor exceptions, although a smashed phone rises above minor, definitely. Are we going to get to hear your new talk out here any time soon? Terri M.
p.s. We have places here that will put a new face on an iPhone within a few hours for $75. Which is definitely wool money, but cheaper than a new phone. Good luck! “Wool stuff” — gotta love it! P.S. Sorry to hear about your phone and the other stuff, and I hope your other bags come home soon. And let us take a pause while *we* “enjoy your wool stuff”. Absolutely bloody hiliarious. Only you, Steph, only you. This post is simply delightful! Thanks for the laugh! Mom thought you were insane too. I on the other hand completely understand and look forward to your reveal of your purchases. If there is any way to love you even more… I have no idea how. You really made about 4000 people happy with your visit. You will be welcomed back forever, anytime, and any way we can get you here. Thank you for visiting us, and we will make sure we have spare pants for next trip! I’m really glad your card wasn’t stolen, although I’m sad your luggage pulled a runner. I hope it turns up soon. I swear by Lifeproof cases. I went around with my newest iPhone feeling totally insecure with it in a waterproof snack bag until they finally released the newest case. If there was any justice in the universe, the bag which has shown up would have yarn in it, and the bag still missing would have the broken pants and the dirty laundry. But, clearly, there is no justice. Thanks for making me laugh. I needed that today. You had me laugh out loud, wish I had been there! I am so sorry about your phone…. But I am still giggling over the credit card. Muggles don’t understand efficient, wool-fume-driven yarn purchases. I laughed out loud and read out the Navy Seal line to hubby. Glad you had a good time! Love the pics of the flowers and signs. Hope your”wool stuff” arrives to Toronto soon. The weather is taking another nosedive back into winter which means the need for more knitting! Laugh out loud (in a totally empathetic sort of fashion). You made my day. Hope the bags, and the “wool stuff” arrive soon. Got a phone call from my bank when I tried to charge a bus ticket from Heathrow to Sheffield. I pointed out that the ticket I charged from San Fran to Heathrow hadn’t been a problem and I really did need to get to Sheffield from Heathrow. They were nice about it. I did get my ticket. And when my wallet was stolen six months later I really appreciated that they didn’t let some jerk charge $600 worth of stuff at Walmart! That said, I hope all your stuff turns up and soon!! Thank you, thank you, thank you. I’ve had a horrible day at work, and I need a belly laugh. I’m sorry you had to go through the trouble with the credit card company (been there, done that only with a hotel reservation at my son’s wedding! ), but you have such a gift for finding the humor in every situation. I hope your purchases get home safely. AMAZING SIGN. Seriously, that it exists makes me very happy. The problem is with mobile readers. Things like Square and others make it super easy for the vendors, but when it hits the bank, the bank sees the card being used at whatever home location the vendor has it set to. So when the charges hit your account, it probably looked like you had purchased stuff from multiple cities in Texas. I know it happened to me at a small craft fair here in So Cal. It looked like I bought stuff from places in Los Angeles, San Diego, Phoenix, and San Francisco all within about an hour, so they flagged it as suspicious activity. The same thing happened to me at Rhinebeck last fall. The bank’s computers couldn’t believe what I was doing. When I called them from the Llama barn to ask what was was going on, I lucked out. The bank lady was another “woolie”, who said she was sad and grumpy because she had to work, and couldn’t be there, too. She understood when I explained about the quiviut and cashmere, but still had trouble believing why anyone would need THAT much fleece and roving! Insane in Texas… just wait until I email this to my friends in Texas. They’ll love it – and tell you EVERYONE is insane in Texas. In the best possible way. It was nice the bank was concerned. They are getting better at this whole CC theft intervention. Please warn me next time I am sipping some tea while reading your post filled with tea-spewing fun! Sorry about the iPhone BTW. As one phone klutz to another, I highly recommend the Otter Box cases. I have personally product tested the Defender and the Commuter. Extensively. I agree with Otter cases being fabulous! I drop my iPhone from about 5′ very often (I’m 5’3″). My old case broke right away, but my Otter just takes it all in stride. My nearly ex-husband bought the first iPhone that we had, and put it in an Otterbox case, which I thought was really ugly… until I dropped the phone while strapping my son into the car seat, dealt with flailing limbs, forgot the phone and closed the car door on it, firmly. The case had a small dent. The phone was unscathed. I still am using the phone four years later, with the second Otterbox case on it. I’ve been feeling bereft, looking for a new post as a pick-me-up in the midst of a long afternoon. And this one is a reward for my, um, patience! I do hope the luggage, which I presume holds some of the “wool stuff,” shows up … soon. Oh my gosh…. ‘wool stuff’ ! that made me laugh. No knitting for him! I have had the opposite credit card problem. They never hesitated over any of my purchases at Madrona. In fact, they considered them typical. But when I bought my son an electronic gift card from Addidas so he could order himself some soccer cleats for his birthday, they decided I had gone crazy and put a hold on the card. They just couldn’t understand why a wool-buying person would suddenly branch out to sports equipment. I’m so glad I wasn’t at work reading this, I would have had a hard time explaining the laughing explosion. Actually, that IS a rather reasonable question; the algorithm is pattern driven, so when your card suddenly showed ‘sports stuff’ it’s reasonable to stop the transaction. ……they just don’t understand…do they…. Laughing and laughing and laughing!! LOLOLOLOL! That’s the best example of power shopping I have ever heard of ! It sounds like you had a wonderful time, in spite of the bank. oh no!!! Good luck with your luggage. Prayers from New York headed your way. I am laughing so hard, there are tears running down my cheeks. That poor credit card employee has no idea how (in)famous he is right now. OK….I LOVED this post. We live in such a crazy world. But….could there be no place better to go insane than…of all places….TEXAS!! Perfection. Best response to a credit card company ever! I do hope that the phone gets repaired/replaced with no drama and that the woolie purchases come home soon. I’m still laughing. ‘Unlock the card, I’m not done.’ That’s the spirit! Thank you for a much needed laugh this afternoon. Add me to the ranks of those who have had a card blocked mid-spree at a Stitches marketplace. I’m sorry about your phone, and your pants, and your bag. I hope it shows up soon. Reminds me of the time DH was at a conference in Vancouver. I got a call from the bank to ask if a £1000 payment to his hotel was genuine. Yes, I said, that’s the hotel he’s staying at. It was only after I put the phone down that I remembered that the hotel had been paid for in advance by the university. Fortunately, I was able to contact him before he left…there was another customer with the same name and his room had been charged to DH’s card! We were very happy to have a cautious bank that day. OMG, so funny – you cracked me up! Hope you get all your stuff back! 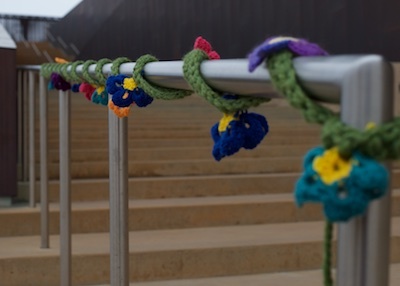 As an Australian spending 6 months working in Michigan I totally understand the credit card issue – mine having been frozen twice by an Australian bank totally disbelieving of the amount it is possible to spend on yarn. They had no understanding of the fact that while it is cold and bleak there in January, there is TONS of yarn available there. And knitting has an actual point in places what’re it gets cold. But what I find so distressing about this post is that I was in transit at DFW last Friday on my way home for a while. The chance to fulfil my dream of attending a fibrefest in the US was right there, but I didn’t know it was on. Devastated! Start planning for next year now. We’ll be looking for you in Texas. 🙂 Y’all come. Wool stuff! You gotta have wool stuff. One year, I switched credit card companies and got my new card right before going to Stitches West for one day only with no classes. Yes, I was there to buy and get inspired by the great yarns and clothes around me. My first purchase on my new card was at Stitches, and they kept going. I had the 800 number for the bank just in case, but someone reviewing it must have been an understanding knitter. Or they thought I spent like this all the time. Hope your suitcase comes home soon. Happy Tails. Hilarious, and the new talk was wonderful! I’m sorry about your phone, but it appears that the bank needs to up its training around fiber-fest times. I expect the bank guy doesn’t have a blog, but I bet he has told this story a few times or more to his workmates. Hope your next phone has a better time of it on the road. I have to make sure I call my card company when I go to Rhinebeck – thanks for the reminder! At least he remembered that it was “wool things.” Goodness. The best laid plans! My bank does the decline routine sometimes, most recently when I spent a lot at the grocery store. But they immediately text me and if I respond to the text and then ask the cashier to run the card again all is well. Of course it seems your mobile had previously died? So even that wouldn’t have worked for you. No wait….I’m still laughing….No, no….I’m still laughing…. Oh Stephanie… I am usually a lurker, but I had to comment! You made me laugh out loud (sorry, I know it’s rude to laugh at your pain). Been there, done that. Now notify bank prior to yarn purchases! Laughing out loud here, at the “wool stuff” and your navy seal comment. You are the funniest knitter I know! And I do know some very funny knitters. 🙂 This post should show up in a book someday. For sure. Good gracious, I can hardly breathe. This almosts tops the story when you got locked out of your hotel room naked. Hoping your luggage finds its way home soon. Being extremely organized is the only way I can get stuff done and it does drive some people crazy. Good to know I could be possibly causing a major banking security incident. Hahahahahahaha!!! It could have happened to any of us. I was slightly nervous myself, probably saved by the fact that I was an attendee and able to spread my insanity over a few days…PS love that you love it here because we love having you!!! I’m there with you on the pay cash. And oh do i remember the days of getting three little boys to bed! I’m glad that every time you were locked out of your room that you had pants on. Even if they were the same ones each time. According to my pals Pam and Karla, your talk and classes were fantastic. And I hear that Flat Sally and Flat Jill were along for the ride. Planning on being there next year in person. Jump on board, Laura! It’ll be a blast! “They decided that it was not possible that this many people could be this interested in sock yarn (I know…I know) and that therefore, considering the complete impossibility of this being a legitimate business concept (can’t you hear them? “This many people just can’t want sock yarn!”) that Blue Moon must be running a SCAM, and (holy moths I can scarcely type it) Shut. It. Down. And of course this would not happen to you if you were buying car parts or sports memorabilia or pens (I go to a pen show every year). Men (and banks) have no imagination. In my extremely unfortunate experience, sock yarn is not what CC number thieves promptly buy tons of when they come upon an unguarded CC number. Yet my bank will call my phone when I purchase gasoline on the east coast, but let sudden CC charges for HotHornyLesbians.com and guitar magazines go utterly unremarked. I think anyone looking for suspicious CC activity should immediately ask themselves, “Is this something a childish 15 year old boy would want more than anything in the world?” If no, then it’s not a scam, for pete’s sake! Strangely enough our credit union security was compromised this weekend and someone DID go crazy in Texas on dozens and dozens of accounts (including mine). We are in Maine. If the fraudulent transactions on my account didn’t say Walmart, I may have been suspicious that “someone” might have been buying yarn. Thankfully everything seems to be taken care of and the bank has refunded all of the $$. All’s well that ends well. Oh I hope the Signature needles weren’t in the missing bag. Say it ain’t so……. LOL Wool stuff. Too funny!!!! There is no better place to go insane than at DFW Fiber Fest. I was laughing so hard about your bank experience that I had to explain it to my husband. Well, a least your bank is taking good care of you. My husband and I read this post together. We’re still laughing! It’s a pain in the rear end when you have to confess to a “bean counter” who had no understanding of fiber addiction, that you really did do all that damage to your budget. By the way, if your card had been stolen, how would the thief manage to use it in different places in just a few minutes. That’s what you get for being organized! Still love your blog. Oh – this one made me laugh so hard. I had to read it to my husband. It made him laugh, too. Glad you had a great trip! OHmigawd, I’m laughing so hard I started to cough, then choke, then frighten the cat who (was) sitting on my lap! I’m more surprised that this hasn’t happened before. I mean, this happens at pretty much every handmade-type festival I attend. Or maybe its just me and I’m the insane one. Either way, we both get cool stuff, even if we are crazy! This post is a true public service announcement for those of us planning to make multiple purchases at a festival. I am going to let my credit card company know what I am planning to do so they can deal with it. I already have to let them know when I am traveling. What a world. Thanks for the laugh today – I really needed it! You. totally. crack. me. up. Love that soap. I could eat it. This is freakin’ hilarious although I’m sure it wasn’t at the time. Ha ha! I can’t wait to see your haul that is currently in transit. Thanks for the laugh. (I’m laughing with you). I admire your restraint – I’d probably have gone ballistic on the credit card company. I mean, it’s not like you don’t have a history of buying yarn, now is it? They are supposed to identify bogus purchases by non-usual transactions, not by very usual transactions in a short timeframe! Oh, what a great story! I think I’ll adopt the phrase ‘insane in Texas’ as a code for ‘spent too much on yarn’ …. and I do really hope and pray that your suitcase turns up soon — I’d be going mad with worry. I’m crossing my fingers for you …. You just want to smack someone. Hahahahahahahahaha!! Loved this post from beginning to end! I have problems every time I visit my child. Yes, I know I don’t shop at a Mississippi grocery every week, but it does happen on a recurring basis. Only annoys me when I want tot check into the hotel and they decline the card. Calls don’t help, we have found we get declined more often she we call. The worst was when we banked with a small credit union, our larger bank deals with frequent travelers and things are much better. Sadly, I think lots of yarn wouldn’t trigger a freeze with my bank. Might make my husband happy. My bank is diligent about confirming my expenditures when travel to a neighboring state, CA, AZ, UT. When I filled up with gas in AZ my husband was called to verify that it was me making the charge. However, last year when a $3500 cash advance was made at a different bank with a counterfeit credit card no phone call was made. I didn’t know about it until my statement arrived. When I called the bank to dispute the charge I asked how in the world I would get a call for a $40 transaction but nothing for a huge cash advance…duh! Her comment was that it must have slipped through the cracks! Gee, that makes me feel good about fraudulent charges. Only a frequent traveler would truly get that you achieved the trifecta of travel…locked out of your room (love the comment about the girl teaching you how to use the card key), the rejected charges and the lost bag! Add in the 18 hours to get home and you totally rocked the Dark Price of Travel game! I play it often, but rarely with as much humor as you! Stephanie, thank you for being so *human* and so kind to share it all with us. I look forward to each and every one of your posts! Thank you for taking the time to take a picture with us. I had no idea how hectic your schedule was that day. On the bright side, at least you were DRESSED when you were having your hotel room key problems! Hope to see you again next year! So many bars of soap from Goodies Unlimited, my favorite. Sigh. “It is possible and it was me” The new battle cry of knitters, crocheters, spinners, and weavers everywhere at fiber festivals! “wool stuff”! I love it! Yeah, really… But they’ll probably learn well after the fact, eh? Enjoy your wool stuff, I love it! Seven minutes of controllable laughter. Now my husband thinks I am insane. And I didn’t even need my credit card. You’ve been so busy being insane in Texas, and then all that travel time to get back to Toronto . . . you may have missed the press conference that John Boehner had. He opened it with a question to a reporter about “Why would you wear socks like that?” The television audience couldn’t see the socks, but Boehner’s next remark was, “I thought the circus was coming to town.” What nbc news didn’t show, and I wanted to see, were the actual socks. I’ll bet they were hand knit for the reporter by his adoring grandmother or aunt. Boehner just has no appreciation for the real thing. “Enjoy your wool stuff.” I love it! Most excellent post and one that I have experienced for myself, although I could not have been so eloquent or humorous about the event. Hoping, also, that you have a never ending invitation to DFW Fiber Fest. See you next time! I read your post to my family. DD rolls her eyes to the back of her head and says “amateur” referring to the bank teller. Obviously he needs to see people with sticks & string in action. Lol. I hope you had insurance on your phone. Still a bummer. Its a pain to lose it when you’re traveling. I know. I once lost mine to a washing machine when I was out of town. O.M.G.! I AM STILL Laughing. I’m astounded that they were so limited in their thinking about how many different purchases you could make in 8 minutes! Phone shopping could be just as dangerous as a weekend event then, really. Here’s hoping the wool stuff of your insanity shows up safe and sound quickly! Aaaaaand that’s why I go to the Bendigo Wool Show with cash. Lots and lots of cash. Definitely need to take cash to the Bendigo Wool Show, the lines at the poor little atm way down the back pavilion are enough to convince me to always have enough for anything I wanted :0) Although if one does venture down that far you find fabulous food stalls-the pizza is brilliant! In spite of the insanity, both the classes I took with you were great. I have been practicing my lever knitting. Also, I managed to lock down my own debit card in the marketplace on Sunday as well, so don’t feel too bad. Your story telling is SO entertaining!!! I find myself wanting to go to the DFW Fiberfest just to take one of your classes (well, maybe to shop a bit, while I’m already there). Thank you for sharing your sparkling personality once again. So funny! All the best with getting your lost luggage back… I loved the conversation with the bank person. Well knit me some horns because I would’ve been so tempted to say, ‘yes, thank you, please reverse the charges’ (free stuff!) and then I would’ve whipped out a different card to continue the insanity. No, not really, I really really wouldn’t’ve done that, but there would’ve been such a long pause, like the teller could’ve counted to 2,000, while I considered fessing up. Too funny Steph, you have the darndest things happen. 🙂 And your flying mojo is off so frequently… 18 hours! Geez. Let me guess your new purchases (and beer) are in the lost bag? Thank you so much for coming to visit DFW Fiber Fest! I loved the lecture Friday AM. This Texan is a very happy and enlighten knitter after attending! 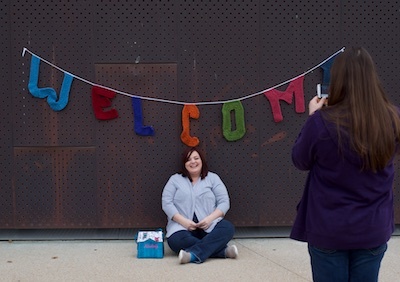 Thank you to whomever made the welcome sign So I could sit under it at the exact right moment. Loving this post sometimes a good laugh is just what you need! You wouldn’t believe the number of shoppers on the phone in one little area ALL WEEKEND that when I passed would say “Calling the bank, they shut down my card.” Or maybe you would! Thank you so much for coming & you know you are always welcome. By the last sentence I was laughing so hard it was difficult to breathe! If you didn’t already have a perfectly good blogging name and Twitter handle, I would say you’d have to go with Insane in Texas. Sorry about your iPhone and lack of luggage. When it turns up, though…enjoy your wool stuff! Sorry to hear that you had so many travel troubles, including with the bank; but very happy to hear how much you enjoy coming to the Fiber Fest. 🙂 Thank you for sharing your experiences (and for your recommendation for the Goodies Unlimited soap – I got the last bar of Stress Free Green Tea this year). I’m happy that Ida B. Knitting (bunny) and I could help reduce your exposure to the market. Here’s hoping your other bag arrives tomorrow, with everything intact and as you packed it. I expected to have trouble with my card, but didn’t – perhaps because my purchases were small and spread out over the weekend. My bank has replaced my two cards twice each in the past year – but everything they caught truly was a fraudulent charge, each time. Second the vote for the Otterbox brand phone cases. They have one that’s justabout military grade, which was the first one I saw (my co-worker had kids, there was a need for it!) There are less robust ones, which also come in several colors. Only problem with them is the rubber will wear HARD on your pockets, if that’s where you carry your phone. My linen trousers need patches thanks to that. And Goodies Unlimited! YEAH! Her wares are awesome. I love her Etomic balm as well as the soaps. FYI: It’s possible to break an Otterbox. My wife did it. The good thing is that it had a warranty and Otterbox replaced the broken one for free! I laughed out loud at work as I read this. The same thing happened to me at a sewing expo several years ago. Unbeknownst to me, they cancelled the last three purchases. A message from the bank was waiting when I arrived home. Fortunately, I was going back the next day, and I gave each vendor a check for the amount that the bank had cancelled. The vendors appreciated that and all was well. I now notify them when I travel! LOL! “Enjoy your wool stuff”! If only YO could have seen his face! Thank you for your story, I laughed so hard my children wondered what they missed out on….. Thank you. Oh my God, I laughed so hard I cried. And because I did, my 21-month-old laughed too. I am so glad I did not save this post for nap time, cause I would have woken him up for sure. Whew. That’s great. Enjoy the procurements of your insanity, whenever they decide to show up. So very funny – thank you !! That made me laugh so much. Thank you. Brilliant. Oh, I’m dying, so hilarious. I hope your wool stuff makes it home soon! What a pain in the proverbial! Still, at least your bank are switched on to such things and are acting. If your card had been stolen . . . Which isn’t all that much comfort what with the inconvenience and potential embarrassment but hey! Meanwhile hope your missing luggage turns up soon. And maybe, should you get another one, you could knit a protective cover for your iPhone? I was laughing through the credit card conversation. That was very realz???? I don’t know. I’ve bought stuff in weird places while traveling and never had an issue with visa. Maybe you need to tell your CC people in advance you’re going go run wild buying stuff in places outside of Canada? In any event, you’ve handled a bunch of challenges with great aplomb. You deserve your wool stuff. Lol! Just lol 🙂 So happy you had such a good time. I’m laughing like a fool because that is the best f***ing story of confusing a well-intentioned credit card company representative EVER. I was reminiscing after your 10 year book anniversary about the early travel posts and the funny (for us) situations you used to get into. And I thought to myself that as a seasoned traveller you now have smooth and uneventful trips and don’t blog about mishaps any more…. well, today it looks like I was wrong. While I’m sorry for your troubles, they make for wonderful blog-fodder. Started my day with a laugh. Thank you for your so very amusing way of sharing your adventures! I was reminicing after your 10 year book anniversary about the early travel posts and the funny (for us) situations you used to get into. And I thought that as a seasoned traveller you now have smooth and uneventful trips and don’t blog about mishaps any more…. well it looks like I was wrong. While I’m sorry for your troubles, they make for wonderful blog-fodder. Thank you for your so very amusing way of sharing your adventures! Your talk was absolutely fabulous! I laughed and cried for all the right reasons. I hope they have you back forever, too! You do have the most interesting adventures! And tell the story extremely well! Thanks for sharing your stories! Loved your post! Your were awesome, just wish I could of been listening to the phone exchange, oh my!! That is way funny!!! I can never think that fast!! Brilliant! Wonder if he put a little star by your account! Ha ha!! So great, this made me week. Too precious! Thanks for the laugh. Glad you really weirded a bank person!!! I hope your bags turn up soon. The guy at the bank obviously doesn’t have any crafters in his life! Hilarious!! I thought I lost mine last yea at DFW FF. Boy, did I panic! I’m so glad you were the one insane in Texas with your card! My card was compromised while I was at Vogue Knitting in NYC, so I ended up being the lady walking around the marketplace with a wad of cash. Having a backup card is smart. Wow, that is insane. I feel a little better about missing it and having to settle for the fiberpalooza in IA this weekend. I went cash only and came in under budget. My plane didn’t get to DFW until Tue and now I’m hanging out with my granddaughter. Some year the stars will align and I can plan to arrive before the fiber fest starts and hang out with my daughter, granddaughter AND wool. Hope you make a full recovery of your bags. I made several trips to Hawaii and charged thousands of dollars on my card with nary an eyebrow raised. Then I went less than 20 miles across the state line and purchased a wedding cake and flowers for my daughter and the bank was all over that in less than 10 minutes, lol. All of these things have happened to me, but not all on the same trip! In our family, we believe that DFW (the airport) is cursed and avoid changeing planes there at all costs, as those are always the trips where things go wrong. I think your story is just further proof! This has to be one of the best posts ever! (iPhone aside) When I need a laugh, I’m coming back to 3/25/15 like a favorite chapter in one of your books! Epic! I will have to book mark this one too. When it comes to your iPhone, if it was an iPhone 6, YOU ARE NOT ALONE! At my job, I handle claims for damaged items purchased with credit cards, and people with brand new iPhone 6s call daily to file claims. These phones seem to be incredibly easy to break. screaming with laughter – except at the parts about not getting all you wanted, not having everything follow you home, not getting home fast, smashing your phone, breaking your zipper and getting a faulty lock – no, them too. Insane in Texas is a wonderful thing to be. And having a carful bank is good as well. Easy to see why the bank is concerned- no doubt the billings are for the vendors’ business addresses, so it looks like charges bouncing all over. “I’m shopping at a craft fair, the vendors are from all over but right now we’re all in the same place,” would explain it. But not be nearly as funny! I was having a really hard day and this totally turned it around. I thank you for being insane in Texas. BTW I did the same thing to my brand new iPad. Steph, I also learned the hard way (cancelled credit card) that when I’m going to be out of town, I call the card companies ahead of time and tell them I’m going to be making major purchases that appear to be made in different locations but it’s because all the vendors came to me. 🙂 That usually causes them to shut up completely because they can’t figure it out. The exact thing happened to my friend at Rhinebeck….cuz she charged several things ALL OVER THE USA in a matter of 30 minutes…. too funny. I was at knit city last October and the vendor punched in her code instead of my price so visa locked my card cause of a 9528.00 purchase. I phoned home and my husband was laughing wondering what on earth I was trying to buy for that amount of money!! Visa had already called home….whew….glad they were on it, and my husband was glad the real price was only 21.98. You can have the credit card company put your cell phone on your account. That way, when they call to tell you about the “fraud,” they get you rather than your home answering machine. Happened to my husband while on a business trip in Brazil. He used an ATM, got declined, and they called our home number. Fortunately, I was home to explain, but if we’d both been traveling, we wouldn’t have gotten the message. See, this is why I carry a buttload of cash to Stitches West…saves me the trouble of explaining to my bank and my husband how I can be in six different places in under 15 minutes. I thought everyone in Texas was insane to begin with. Well, at least I am in good company. I thought I might be the only one. I live in Texas, paid down my credit card deliberately so that I could go crazy with it at FiberFest, called my bank and told them I planned to be shopping in Irving, and then made good on my promise. Holy smokes did I buy a ton of stuff! I bought a ridiculous amount in fiber, like over 12 lbs. total of fiber. And I bought 4 8oz.-braids of Tencel to boot. (What? I said it was ridiculous.) I bought some actual already-spun skeins of yarn (just a few), a lazy kate for my wheel, 3 more bobbins, and the biggest basket/coffee table of those woven willow baskets. And a signed print by Franklin Habit. SO cute. I need to get a frame and hang it in my office at work. Next time you’re in DFW you should go to the button store. It’s only 8 miles from the Irving Convention Center. They also do mail order and have pretty much every type of button your little heart desires. It’s fantastic. I went and bought buttons to go on the sweater I plan to knit from the MadTosh yarn I bought at the store. And some more because buttons. I can also recommend Rusty Tacos near the button store. Delicious! Seriously good tacos and salsa and the chips were freshly made. We need one (or more) in Austin. Now I can’t wait until Stitches Texas in September! If you’re coming to teach (Yes? Maybe? Maybe yes? ), remember that September in Texas is still not-quite-the-height of summer, but really, really hot. I may have to get a second job. Or call my bank and get my limit raised…. It’s so awful that you have such bad things happening to you so often!! OMG!!!! You have made me laugh until there are tears in my eyes!!! Thank you. You have some of the most hilarious experiences ever…this one definitely rivals the time you were locked out of your hotel room in only your undies. Reminds me of when I went to the knitting festival on Fanø ( a Danish Island – other part of the country) by train. I was so smart, hiding my credit card at home in order not to buy too much yarn, and only brought cash. LOL. Having had my card compromised 3 times in 18 months I can totally relate to the frustration. Fortunately, I, too have a bank that is really on top of things. The 3rd time it happened I was notified literally within minutes of some serial on-line gaming charges, something I never do. Glad your bank is alert. Sounds like a fabulous trip otherwise. HAHAHAHAHA! (Sorry, sorry *guffaw* sorry) Very often, I must read your posts aloud, to any child in earshot. This was one of those times. Glad you had some fun shopping. Hey Stephanie, if you got an iPhone 6, get a rubber cover immediately. Those suckers are beautiful, slippery, and balance weird after a 4 or a 5. I dropped the phone and cracked my screen within 24 hours (Apple replaced it for free, though). Oh, I SO needed that right now. Strike another for the knitting-clueless in the world! It is possible, I am not insane, enjoy your wooly things. Oh yeah! Just read this to my husband who reminded me that I had a call when he was in the USA buying a dinner jacket (once he had translated it to tuxedo), 5 minutes after he had called me to ask my opinion. I was able to say to the credit card company, “ooo he bought the tuxedo then” which was enough confirmation that it hadn’t been stolen. So funny! I had to bite my lip though for fear of waking up my seven week old baby who is asleep on me! Ahhhh…. This made my morning !! Yes!! As I am enjoying my coffee on this dreadful morning I laughed out loud. I especially loved when you told the voice on the phone to unlock your card…. You were not done shopping!! I love it! There are so many that just don’t understand the fiber world. At least the credit card company is on top of things. Hope you get your things back soon- signature needles and soap? The exact same thing happened to my card there as well. Fortunately I had more queued up and just kept charging but I had to have the wool discussion with 3 different banks………. Since I’m from Texas, I didn’t have to explain I was Insane in Texas – they already knew…..
Hello, first time reader here! Were all the vendors using Square or similar point-of-sale gadgetry? This highlights a problem I’d never thought of: that all the Squares in a single room at a convention will be registered to locations that are long distances away from each other. Warning bells indeed! I know I should not laugh at another’s misfortunes but laugh out loud I did while reading “Someone went insane in Texas”. Its unfortunate you did not get a customer service rep who also knit. There would be no need for explaining. Enjoy your wool stuff is the best comment ever. Unfortunately, my over zealous credit card company did it to me this week. It prevented me from buying my son’s high school graduation gift – a weekend pass to Lollapalooza. 🙁 I called the fraud department who asked do you buy from Lolla often? Uh yes, once a year! Suffice to say I had another bank card ready for the one day passes but I couldn’t get through. I’m glad your credit card people are on the ball, but their timing does not rock. Hope you got to go back and execute the remainder of your plan. On the other hand, if someone else were insane in Texas with your credit card, they would have prevented a lot of grief. Beautiful yarn and cowl in the next post. This is a very conveniently timed post. I’m about to go on holiday with my partner, a holiday that includes the biggest alpaca event in Europe and a visit to World of Wool. I explained that the wool fumes get to me sometimes and make me dizzy, so I really can’t be blamed if I make impulsive purchases and a few minutes later I read this blog post. It’s not just me! Thanks for supporting my addiction! 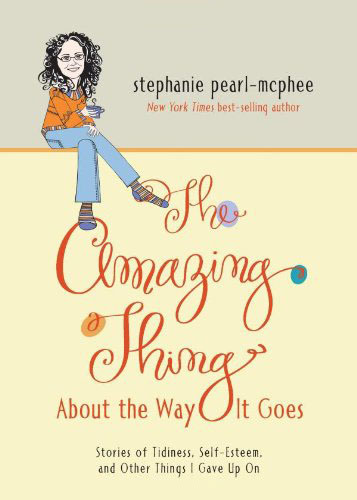 Stephanie I’ve been reading you for years, but this, I think, is my FAVORITE post!!! I travel for work too and have had the credit card misfortunate call, but this one is the icing on the cake. LOVE it. Still LOLing. I cannot thank you enough for this post. I have been laughing all day as I keep remembering it. “It’s me. I’m insane in Texas.” I might just pee my pants. Thank you for making me cry tonight. I needed it. Check the DFW Fiber Fest FaceBook page for a link with Stephanie. This is a classic Harlot post. Thank you so much. You’d think a credit card company could figure out the types of purchases one REGULARLY makes. Sarfari has no trouble posting ads about every little thing I buy on line. I bought a “medical alert” device-plus service on line for my Dad a year ago. They have bombarded me with ads as if I would need more than one? Does anyone have a stash of medical alert systems??? I don’t know how you manage to have so many funny things happen to you, but please keep doing it. I think “Insane in Texas” may just top “The Reason For the Divorce” as my favorite story. Haha, thats amazing, they really haven’t got used to the fact that small vendors can very easily now have machines enabling them to take card transactions, I absolutely love my machine, it’s saved me so many times when people have realised they’ve run out of cash. 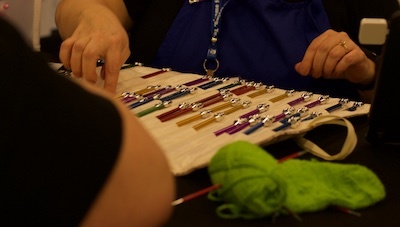 DFW fibre fest looks amazing from all the pics i’ve seen, I’ve only been going to tarn festivals for the past year selling my knitting needle jewellery and so far I’m loving it! So inspiring, I’d like to try dying and weaving and and and….. I too get carried away with paying by card at these events, and I’m meant to be trying to sell! Sorry your phone broke, and that your bag is still now home- hope it finds you soon! Lucky you (although it did not feel like it at the time). My card company did the same thing the last time I was at the Bead & Button show (some of us have more than one vice: “oooooo..shiny”) only they took it one step further. They immediately closed the card !!! Some foolishness about “procedure”. My shopping was done for the day (I was barely started) and I had to wait 2 WEEKS for my replacement card. Perhaps the budget control fairies were at work. Thanks for the giggle!!! You are such a wonderful story teller…. anytime you start off a post, with “Let me tell you a little story”, I know we are in for a good one… I laughed aloud for a long time, and each time I re-read the post… I laughed almost as much (completely in empathy) as your post about “the reason for divorce”…. Oh my goodness, Texas, the guild and the fiber fest sound lovely… I try to take cash to Stitches to avoid that… I hope you had fun with the remainder of your shopping excursion and that you have an amazing time unpacking your returned bag…. Thank you again for a lovely blog! “It was me. I’m insane in Texas.” I love it. I’d have loved to be insane in Texas too. Oh I just love unlock the card I am not done. With all the hacking that goes on it is great that they are watching. But only if it is not you on the spending spree. I had my ITunes account hacked at 4:30am and my bank immediately locked my account. When I called them after my card was declined, they explained why they had locked it. I asked, “How did you know it wasn’t me that ordered a candle?” She said so kindly, “It wasn’t yarn or fabric, so we knew it wasn’t you. Besides, you would never order anything at 4:30am.” It is scary that my bank knows my habits so well. Thank you, thank you, thank you for this hilarious tale! I was feeling like a total loser today when my daughter send me a link and told me to “Read ‘Insane In Texas’ you’ll feel better. Oh yes I do! Dear Lady, you are my idol! Thank you for this post. I was sorry to hear about your problems, but the final “Enjoy your wool stuff” had me laughing. It had been a bad day and this really brightened me up. Thanks again to a wonderful person. I’m so glad to see the words “self striping.” I’ve fallen off the knit wagon and am attempting to hop back on. For some reason, those words seem so comforting. Any suggestions on something that’s caught your eye recently? I just keep seeing the same ol, same ol. LOL!! Best laugh I have had in a long time and it took me back memory lane. A couple of years back most of European airspace was closed to to an ash cloud from an erupted Icelantic vulcano, and you had to be very creative when travelling. I was asked to travel to Asia for my job in an emergency case, so we started out from Denmark an early Saturday morning by car. Destination was Frankfurt Airport, where I would catch a flight to Asia. Ha!! Two hours from Frankfurt, they closed the airport, so after a very long talk with travel agency, next stop was suddenly Barcelona…..by car. Boss saw no other option to continue his “taxi service” so we arrived Sunday night…. Monday morning flight from Barcelona via Tunis and Dubai and ending in Seoul Tuesday afternoon. Here’s where I got an urgent call from colleagues asking me to call credit card company ASAP!! Somehow I am happy that they had kept and eye on the card transaction – but equally happy that they didn’t decide to cancel my card without asking. That was funny but I’m sure you were going crazy figuring it out. I hate the bank stuff. I’m glad you had a great time although crazy at times in Texas. I live about 3 hrs away and just couldn’t get their this year. I would have loved to meet you. Maybe next time!! Your awesome and enjoy your blog posts and books. Too, too funny. Thank you. I am sitting here sick with the flu and I needed this. Just visited my snowbird in-laws in Arizona, and my father in law had experiencing problems with his CC being declined. Apparently his bank had security issues and sent replacement cards to his house while he was away. Since the post office can’t forward those, they were returned to the CC company. There was never a phone call to ask why the cards were returned, so my FIL had to call and find out what was going on. Eventually it was sorted out, but he was still PO’d about it when we got there. DH and I suggested that in the future he notifies his card companies of his extended travel plans. I just love banks. They are so efficient at screwing up our lives some days. On the other hand they are also very efficient in times of real trouble. Love the pictures you post. The fiber festival looks amazing. Please share more. Now for the big question……did you get to finish your shopping? Catching up on some overdue blog reading and so glad I did! This post had me laughing out loud, and I don’t do that very often. I love reading your stuff. Thanks for making me laugh. Unlock the card I am not done.